This site is about Artists and the Arts in various forms and media. I have tried to give a very comprehensive source of information on the carving of soapstone in the Sculpture Section with information on sources for obtaining Material and Tools. 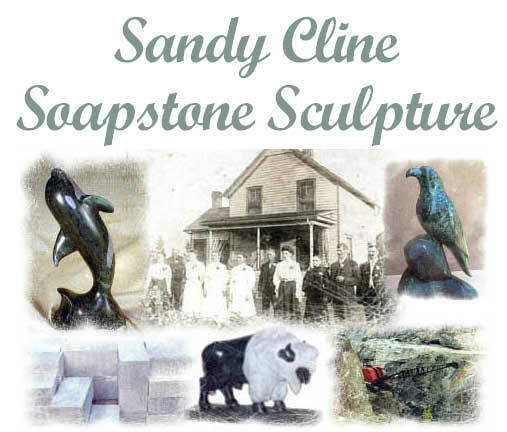 The Soapstone sculpture pages are a meeting place for old and new sculptors who work in soapstone. A place where they can show their. work and exchange ideas. If you are looking to repair a damaged soapstone sculpture, basic information is in Scratched, Bruised and Chipped. The Showdates page, lists shows and events I plan on attending and photos of shows, demonstrations and schools that I have been at in the past, you can check if I will be in your area in the near future. Carving for beginners and school children on the Simple Carvings page. There are instructions for making heart and arrowhead pendants, a simple mouse and a seal. If you feel like making your own sculpture, you can; "Carve a small loon", "Carve an eagle" or "Carve a polar bear"
German translations of carving pages are "Wir schnitzen einen kleinen schwimmenden Eistaucher" and "Anfertigung eines Eisbaeren aus Speckstein"
I try to update the New Work pages with the carvings I have finished recently. You can view some of the latest sculptures and those still available to purchase at my Studio, Whetung Gallery. Windy Ridge Canoes is owned and operated by Michael and Susan Butz who hand build canoes in cedar/canvas, cedarstrip, lapstrake, rowing skiffs, wooden sailing boats, ultra-light canoes, silent electric water craft and wooden inboards. The Links page will take you to many of my artist friends.